Art and Culture of India has attracted the world from the beginning of time and these two are major bonding elements which unite India, in spite of vast diversity observed by different regions, communities and people in general. Diwali is the festival of lights which is not only celebrated in India but also in Nepal, Sri Lanka, Myanmar, Mauritius, Guyana, Trinidad & Tobago, Suriname, Malaysia, Singapore and Fiji. The festival is a major Hindu festival but the whole India celebrates it with equal enthusiasm and warmth by lighting lamps all over their homes, shops and institutes. It is believed as per Hindu mythology that lord Shri Ram returned after his 14 years of exile with Sita nd Lakshman after defeating Ravan. To celebrate their return , the people of Ayodhya lit lamps all over the city. This became Tradition since then. 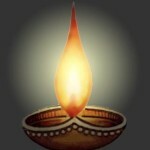 Meaning of Diwali: Diwali (दीवाली ) has been derived from Sanskrit word Deepavali (दीपावली ). Deep(दीप ) means lamp of clay filled with oil(like the one in picture on left) and Avali (आवलि ) means Row. So Deepavali means row of lamps. These lamps are kept on during the night and one’s house is cleaned, both done in order to make the goddess Lakshmi feel welcome. Firecrackers are burst because it is believed that it drives away evil spirits.During Diwali, all the celebrants wear new clothes and share sweets and snacks with family members and friends. In most of the Indian regions , Diwali is a 5 day festival which starts on Dhanteras, celebrated on the thirteenth lunar day of Krishna paksha (dark fortnight) of the Hindu calendar month Ashwin and ends on Bhaubeej, celebrated on second lunar day of Shukla paksha (bright fortnight) of the Hindu calendar month Kartik. Dhanteras usually falls eighteen days after Dussehra. In the Gregorian calendar, Diwali falls between mid-October and mid-November. The festival starts with Dhanteras on which most Indian business communities begin their financial year. The second day of the festival is called theNaraka Chaturdasi. Amavasya, the third day of Diwali, marks the worship of Lakshmi, the goddess of wealth. The fourth day of Diwali is known as Kartika Shudda Padyami. The fifth day is referred to as Yama Dvitiya (also called Bhai Dooj), and on this day sisters invite their brothers to their homes.